"As gas became uneconomic, the entire season’s oil supply rapidly depleted"
This is a story best told in graphics. As I noted earlier, the generation mix on the grid shifted heavily to oil. On December 24, 2017, oil supplied 2% of grid electricity. On January 6, 2018, oil provided 36% of the electricity. ISO slide 14 shows this very effectively. 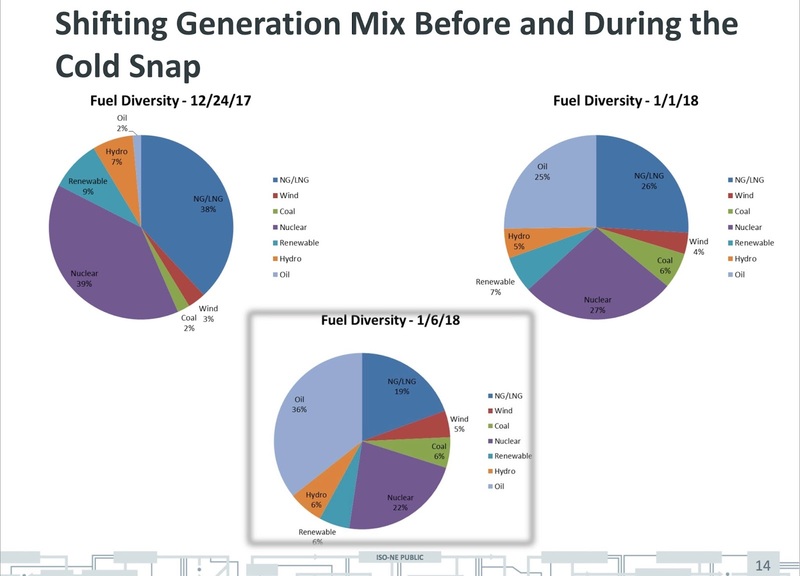 Update: Ed Pheil pointed something out to me: if I don't explain that demand on the grid was rising between 12/24 and 1/1/, the decline in nuclear's share of the grid electricity (from 39% to 27% etc.) is inexplicable. Did the nuclear plants go off-line? No. 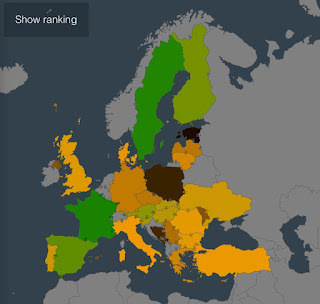 But there are only so many nuclear plants, and they can make only so much power. 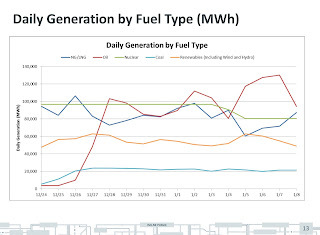 The chart below shows a steady line of "daily generation" for the nuclear plants. It is the green line near the top of the chart. There's one exception: Pilgrim went off line when a transmission line failed. You can see the dip. Thank you to Ed. This was a necessary clarification. Due to power plants using lower-priced oil, however, prices on the grid rose from around $50 to around to $450/MWh, only a ten-fold rise. The region was burning oil far faster than it was replenishing it. 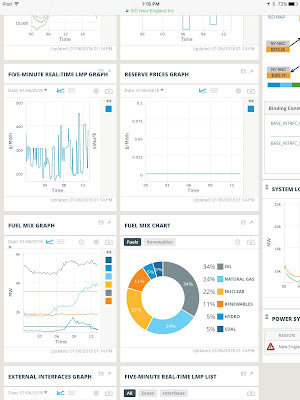 On December 1, we had 68% (of the maximum oil) available to power plants. On January 8, we had 19%. 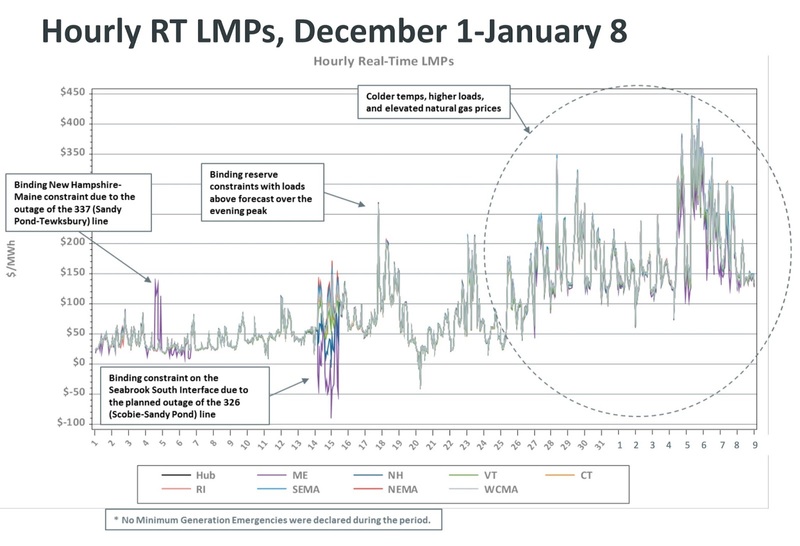 For a more dramatic picture, ISO shows a single power plant's oil supply, which went from an eight-day supply to a one-day supply over the same period. And then there was all the scrambling to keep things going. Slides 35 and 36 show that there were emergency conference calls about the grid---pretty much every day. Much as I dislike burning oil for power, I dislike widespread outages even more. 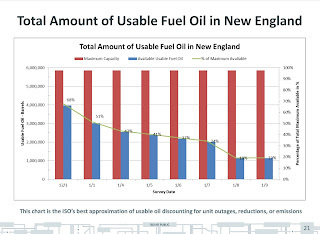 I give ISO-NE tremendous credit for the Winter Reliability Program, and for keeping the lights on. 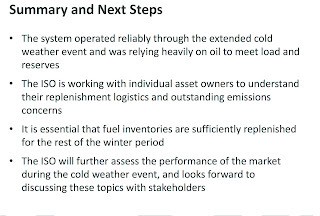 According to the last slide in the ISO program, replenishment of oil is the key issue for reliable operation during cold weather in New England. ISO-NE is correct, according to their charter. However, the ISO-NE charter is limited. For me, the important thing is to keep Northeastern nuclear plants operating. Nuclear plants are thoroughly reliable. (Yes, Pilgrim went offline due to a transmission line failure.) Nuclear plants keep making electricity, no matter what the weather might be, as long as there is a transmission line to send out their power. In cold weather, we need reliability. In cold weather, we need nuclear. Successful encouragement of oil on the New England grid, December 27. Advocates, NEI and Unions. Advocates are essential. This could simply mean that these companies prefer to hire their own public relations firms and lobbyists. Eliminate the middle man, etc. Another possibility is that nuclear energy issues are so state-specific that an institute focused on Washington has become less relevant. I can think of all sorts of reasons why this "may not be so bad, really." But I think it is bad, really. I consider these major withdrawals from NEI to be very bad news for the nuclear industry. To me, this also means that ordinary people who support nuclear energy have to be out there, supporting it. The big institutions may not be doing their part in the future. Update: In a post today, US Industry Faces Watershed Year, Dan Yurman has further background on events at NEI, plus links to this post and other posts on the need for advocacy. Usually, I don't write about "labor negotiations are ongoing..." etc. However, according to this LOHUD article, Indian Point Strike Deadline, one of the big issues in the on-going contract negotiation is whether current plant workers will stay on to do the decomm, or whether Entergy will turn over the decomm to a separate company: "Topping the list of worker concerns is whether they will have a role in the years-long dismantling process that will follow Indian Point's shut down. " Keeping the current workers on-site will be difficult, because the people who operate a plant have different skill sets (and usually higher pay) than the people who decommision a plant. If Indian Point was going to operate for another twenty years, this entire issue would be irrelevant. Plus, New York would continue to have clean power. To me, the union request means that ordinary people who support nuclear energy and plant operation have to be out there, supporting it. The big institutions (NEI, unions) are changing their roles. The nuclear industry needs its supporters, now more than ever. It needs all the people who are willing to write letters, talk to their representatives, speak to a high school group or a Rotary, hold a rally, teach a class at the local community college, everything. Nuclear advocates: the people of the world need you more than ever! I am somewhat cheered by the number of pro-nuclear groups that are active now, and the number of pro-nuclear books that are currently being published. And the videos, blogs, white papers, etc. Still, we pro-nuclear advocates are need to up our game, be out there, be effective. It's up to us, now. The first meeting of the nuclear energy study group at Dartmouth was true to its name: Nuclear Power for Climate and for People. Bob Hargraves gave an excellent presentation on carbon dioxide and the role nuclear energy can play in carbon dioxide abatement. 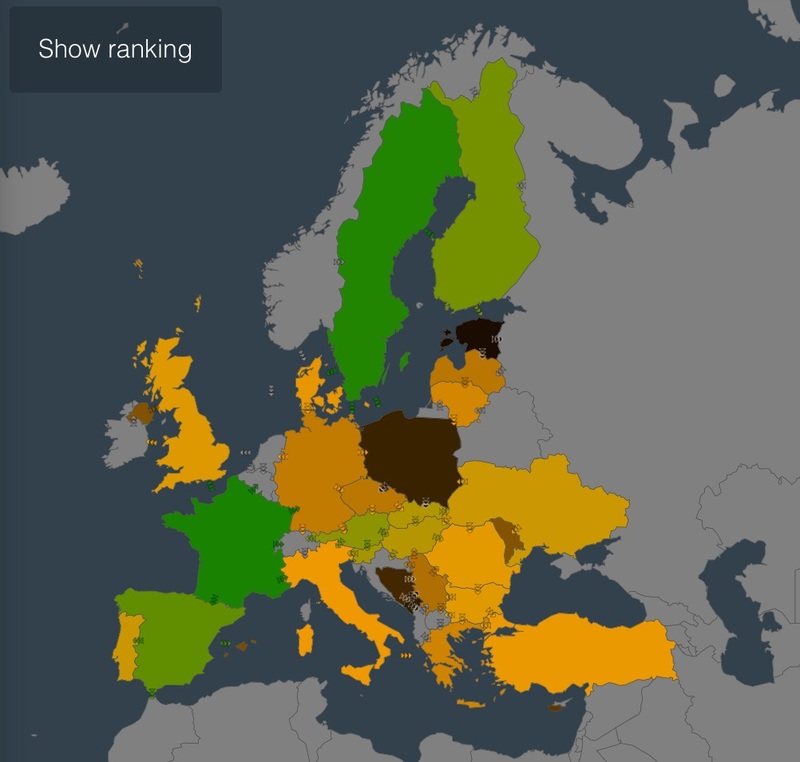 I sent the class members links to sites where you can watch the carbon content of the electricity sector, pretty much world-wide. Here's the note I sent. Our first session was mostly about climate change. 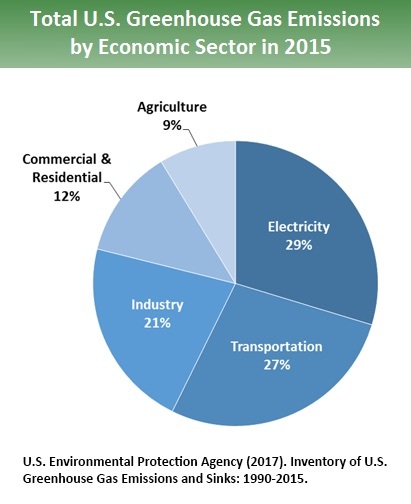 In general, the electric sector is only part of the problem: industry, heating and transportation are important sources of carbon dioxide emissions. However, almost all decarbonization plans for those emissions involve using electricity in other sectors: electric cars, heat pumps. 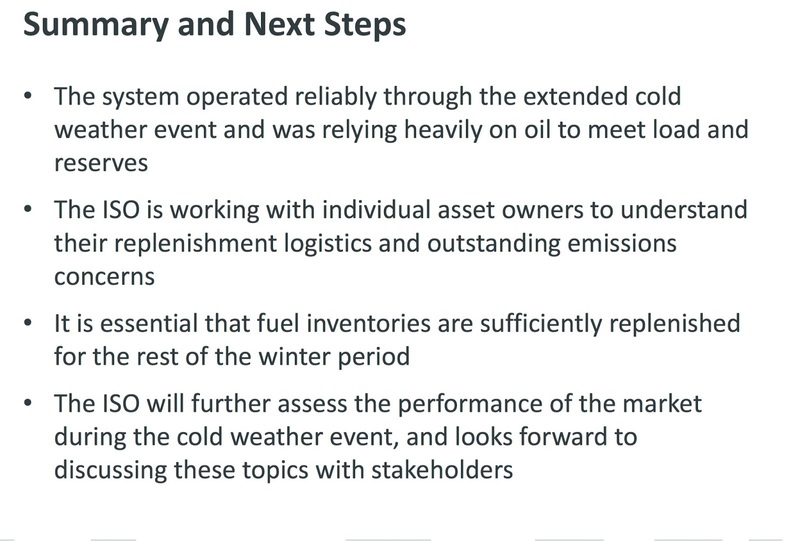 So the carbon dioxide content of the electric sector is essential, right now and in the hopefully-decarbonized future. Little stuff: To move between areas in the map, click and hold. While holding, you can drag the map around with your mouse. You can also zoom in and out with your mouse. Wind and solar are listed as "false" above, because I have not checked the "wind solar potential" boxes. I am suspicious of the word "potential." I want real time data, not projections. For fun, let's click on France, which is green on the map. Okay, next, let's click on Germany. The difference between the low-carbon and renewable numbers is nuclear--low-emissions but not renewable. Ontario is mostly nuclear and hydro, New York is mixed, Alberta is coal and natural gas. I think their "other fossil" is coal. Coal is--- "He who must not be named." Enjoy these maps. I think "playing around" is the best way to find out stuff. Have fun. We will see you Thursday! Dr. Robert Hargraves of Thorcon Power (the Do-able Molten Salt Reactor) and I will begin leading a four-session study group this afternoon. The study group is a course at Dartmouth OSHER, and the title of the course is Nuclear Power: For Climate and for People. The course is oversubscribed (has a waiting list). I always have some butterflies in my stomach before starting something new. Anything new, despite how familiar some parts of it might be. Yes, I have taught other courses and been on many stages. Yes, that helps. 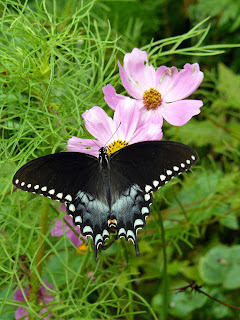 I remember an Aikido sensei who told my class: "If you have butterflies in your stomach, make them fly in formation." I am starting a new course this afternoon, with Bob. All right. Get in formation, butterflies! MIT Prof Kerry Emanuel, in his 2017 OSHER@Dartmouth summer lecture, raised awareness of the potential for nuclear power to reduce CO2 emissions that force global warming. Building more nuclear power plants is opposed by many on the grounds of health, safety, and expense. Fission power plants can provide inexpensive, ample power, especially for developing nations desperate to advance prosperity of growing populations. In four sessions we’ll cover the arguments against and for nuclear energy. We’ll first have a tutorial on energy, power, sources, uses, value to civilization and prosperity, energy poverty, and civil unrest where there is little. Second, we’ll review Emanuel’s lecture and book on global warming, CO2 in the air and ocean, the solar/ wind bandwagon, and the politics of IPCC, Kyoto, and Paris. Third, we’ll cover how nuclear power works, why it’s opposed, and the future potential of energy cheaper than coal. Finally, we’ll cover activities of social organizations fighting for/against nuclear power. Robert Hargraves has taught OSHER@ Dartmouth courses on energy, politicized science, and internet money. Meredith Angwin led The Grid and other courses for OSHER@Dartmouth. 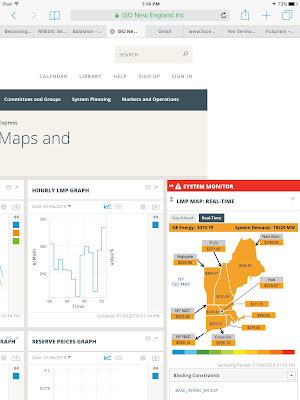 Grid prices in the Northeast. 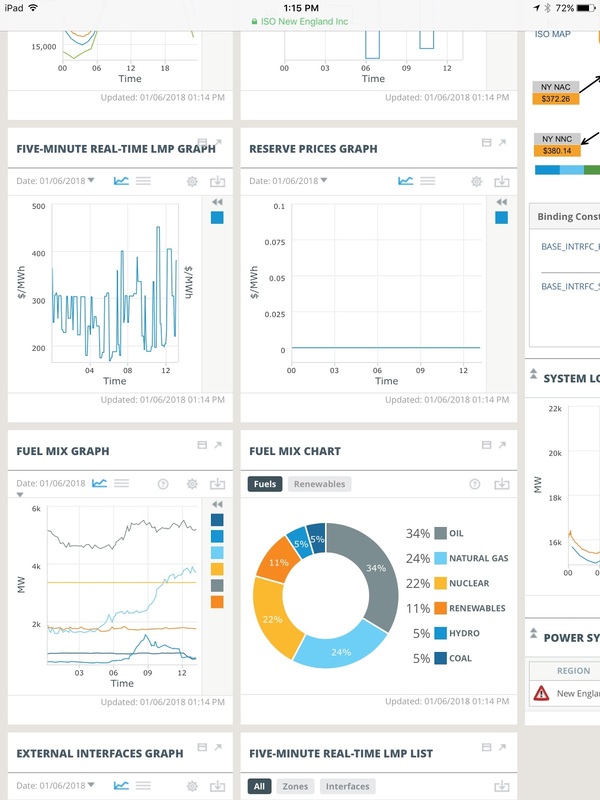 Running about 37c per kWh at 1 p.m.
You can double click to enlarge the graphics. Vermont remains in the deep freeze. It was minus 5 here when I wrote this at 8 p.m. Saturday, and it was about zero at 1 p.m. Saturday when I took these screen shots. The weather is actually colder now, Sunday morning. 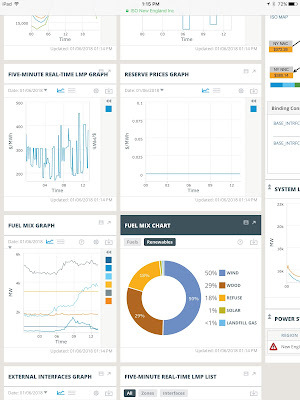 It is minus 15 at 9 a.m. Fuel oil is supplying 37% of the grid now, and the price is around $300/MWh. I'm going to use the screen shots I took yesterday, because things have not changed very much. As usual, all charts are from the ISO-NE ISOExpress web page. 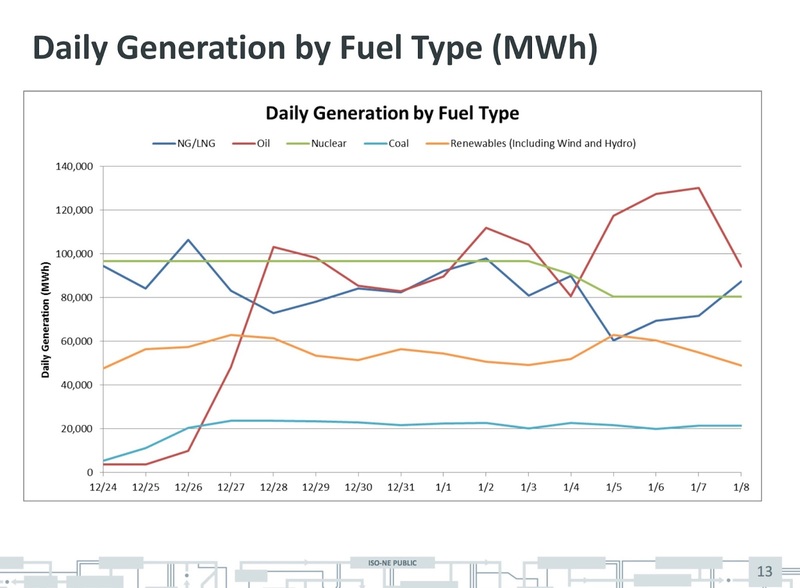 On Saturday, fuel oil supplied over 30% of the grid electricity, and the price of power was bouncing around like crazy between $200 and $400 per MWh (five minute LMP graph at left). 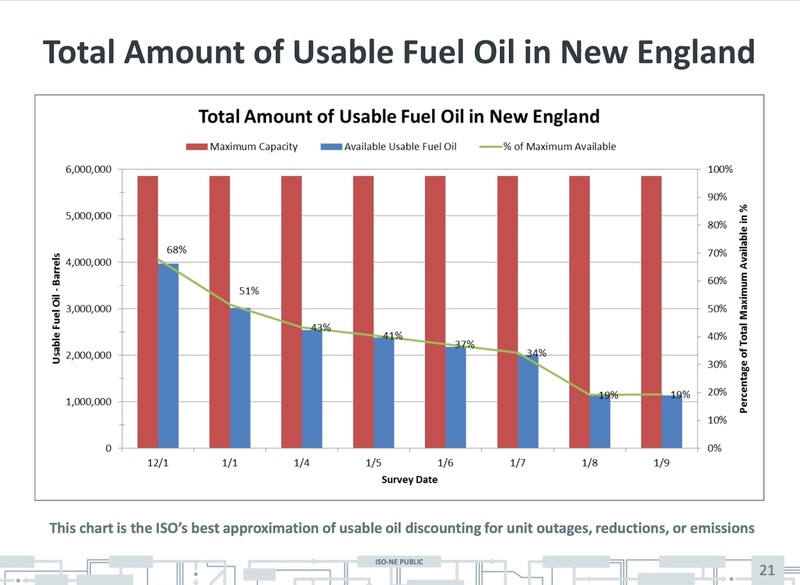 Meanwhile, the fuel supply for New England has been getting a bit dicey. (It seems to be hanging in there, for which I am grateful.) 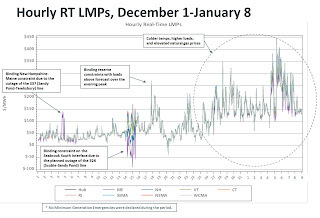 According to an article in Reuters, Frigid weather sends heating prices soaring as energy usage spikes, spot gas prices in New England soared to a record-breaking $82.75/mmBTU before falling back to a more normal $3.80/mmBTU. More tankers are heading to the U.S. These tankers are not on a mission of mercy. Right now, the East Coast is the most high-priced market in the world for oil. The tankers can get their best prices, right here. Coast Guard icebreakers have been used (probably still being used) to keep open the ports of Boston, New York and Philadelphia. A Coast Guard icebreaker was even needed on the Hudson River. Overall, the grid is working okay and I am not very worried. I appreciate the Coast Guard! Meanwhile, some of my earlier posts got some play in bigger media. Jazz Shaw is a major contributor to the widely read blog Hot Air. 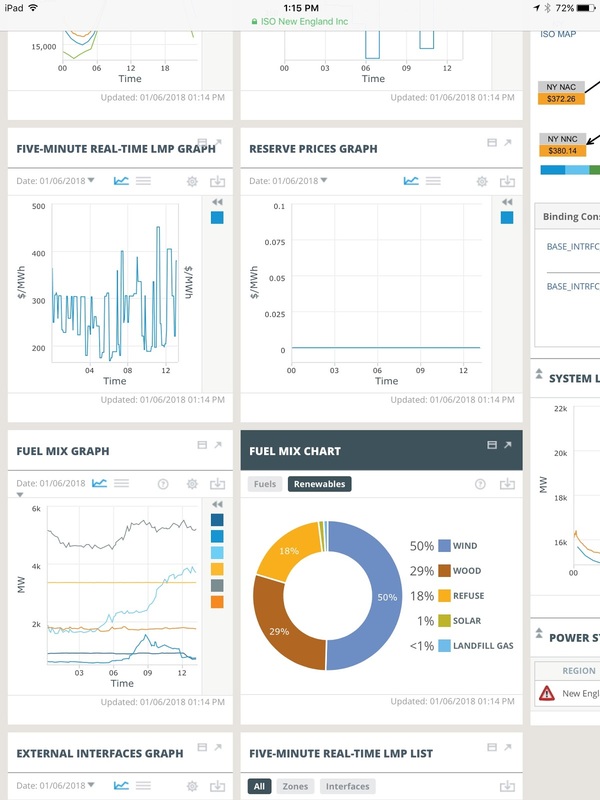 On Thursday, Shaw wrote New England Wanted to Use All Renewable Energy...Then It Got Cold. This is a very well-referenced and well-written post. Shaw quotes my blog extensively, and he also puts the issues in New England together with Rick Perry's aim of rewarding reliable power plants. I should also mention that Hot Air is a very widely-read blog. As soon as the Hot Air post referencing my blog appeared, email after email arrived: "Hey Meredith, you were on Hot Air! Great going!" It was fun. Most of these emails came from my friends, but one note was from someone new to me. A man who writes the Dark Island Puerto Rico blog wrote to say that Vermont and Puerto Rico seemed to be having some similarities. He also wrote a blog post about this, also: Weather and Wind Problems. They say there it is "an ill wind that blows nobody any good," which means that even bad situations can have some good in them. The situation on the grid isn't great, to put it mildly. However, my recent blog posts have introduced me to two new blogs: Hot Air and DarkIslandPR. That is some good, and I appreciate it. At its peak, the Vermont Yankee plant generated more than 70 percent of the electricity made in Vermont. It was the largest, most reliable source of clean energy in the state and one of the largest plants in the New England grid. But like many other nuclear plants around the U.S., Vermont Yankee was no longer economically competitive and was losing money for its owners. Its closure would cause harm across many states – and for many years. The environmental and economic effects of closing Vermont Yankee were severe, and they were completely predictable: air pollution increased, as carbon-free nuclear energy was replaced by natural gas; energy costs increased throughout New England, with utilities warning that customer bills could rise 50 percent or more during the winter; and the region’s economy slowed as 1,000 jobs and $500 million in annual spending dried up. Most painful, though, was the human toll on the Vernon VT, community as nuclear workers were forced to leave behind loved ones and neighbors in search of work. In the two and a half years since Vermont Yankee closed, many good people had moved on. Someday, the community might recover. But it will never be the same. When he made his political case that Vermont Yankee should be “retired,” then-Gov. Peter Shumlin promised a “billion-dollar bonanza” for the state. Shumlin argued that, in the short-term, decommissioning a nuclear plant would provide employment, income and spending on par with a functioning power station. While Vermont Yankee was operating, it employed more than 600 people with salaries averaging more than $100,000 a year. Those dollars cycled through the local economy, creating hundreds more indirect jobs. But closing the plant was not a jobs bonanza – it was a jobs cliff. Hundreds of people lost their jobs, and nowhere near that many jobs were created or likely to be created. To contradict Shumlin’s assertions, I looked at the history of other nuclear plants that closed. What I saw wasn’t pretty. 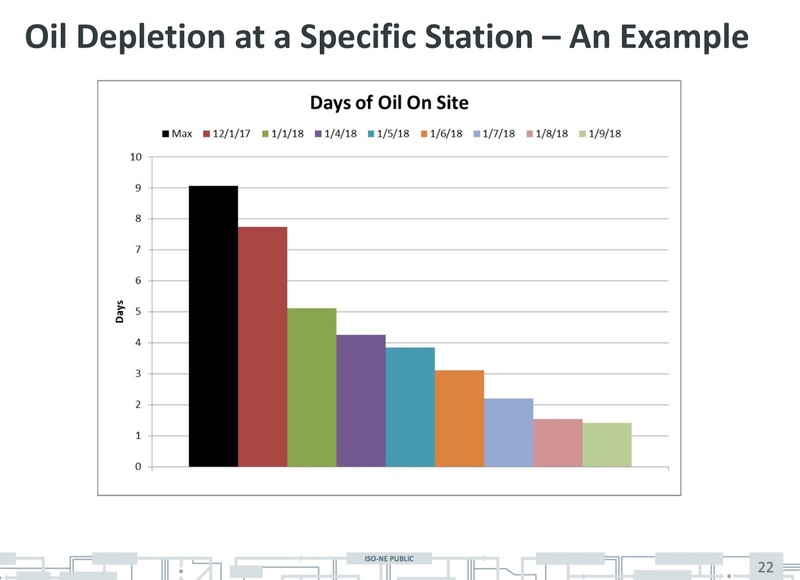 One of the lessons learned about decommissioning was that a closing plant must downsize its staff quickly and aggressively, in order to decommission within the budget of the decommissioning fund. Lessons learned were everywhere, but they weren’t happy lessons. Wherever a nuclear plant closes, the pattern repeats itself: employment and average incomes fall, which means that tax revenues that fund schools, government services, roads and communities fall, too. To make up the losses, tax rates must rise. In general, the first tax rate to rise is the local property tax. At the same time, the departure of nuclear workers increases the number of houses on the market, and lowers property values. Local businesses also suffer as temporary workers hired for periodic refueling outages no longer come to town: the outage contractors no longer rent rooms, eat at restaurants, buy groceries or fill their cars with gas. They no longer give the area economy a cheerful boost of workers making good money, with money to spend. Emissions of carbon and other pollutants rise as clean nuclear energy is replaced by plants that burn fossil fuels. And when a nuclear plant’s around-the-clock supply of electricity is turned off, the law of supply and demand dictates that energy prices must inevitably rise. 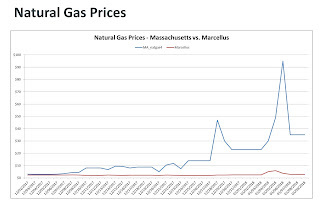 Even though natural gas prices are low now, when a nuclear plant closes, it creates more competition for the natural gas and the price of gas rises. 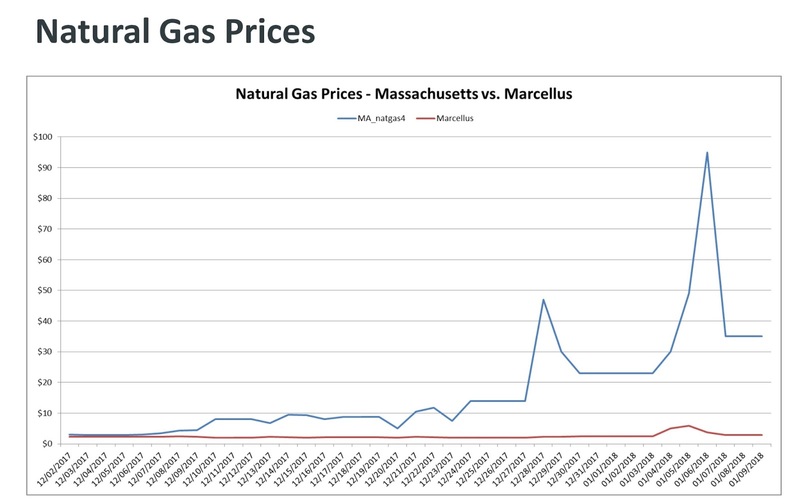 As natural gas prices rise, so do electricity prices. NJ Needs Nuclear: Patty from PSEG on Vimeo. Nuclear workers are highly skilled, highly trained and highly sought-after. There are jobs to be found at other nuclear plants – for someone who is willing to uproot and leave their friends, their kids’ schools, their churches, their doctors, their favorite restaurants, their church choirs or their poker buddies. In some cases, families were split as one spouse moved to take a new job at a faraway nuclear plant, while the other stayed behind to allow children to stay in school. A plant closure could break up a family for months or years. Change will never be easy, and it will be harder for some than for others. But plant employees will move on, and they will live well. For younger people, living well probably means getting out of town, taking their lumps on the declining local housing market and starting anew. Older people may see the loss of a job and community as a betrayal of their lifelong work and plans, and may be less able to start over or go somewhere new. Today, Vermont Yankee is closed, and the region is forever the worse for it: More carbon in the air, fewer jobs, higher taxes and rising electric bills for those who stay. At one low point, during town meeting, the town of Vernon decided to disband its police force and sell off the cruisers. They could no longer afford their small police force. Hard decisions had to be made. For a plant closure, it is comparatively easy to assess the bottom line in monetary costs. Economic input to the area down severely, taxes no longer collected, energy prices going up. The human cost – people losing their jobs, becoming discouraged and displaced as they are forced to move to new areas – cannot be calculated. I believe the nuclear industry will survive. Nuclear workers are smart and resilient. I think the future will work out well for all of them. I’m less certain about the communities left behind. The above column is sponsor-generated content from New Jersey Needs Nuclear. Note: This article is reblogged. It was first printed as sponsored-content in Politico.